CBD (cannabidiol), the completely legal, non-psychoactive calming property found in marijuana, has been touted throughout NYC as a weed substitute and a wellness fad, found in restaurants that are either (1) seeking relevancy or (2) mixing it with activated charcoal. Adriaen Block is offering option No. 3. Set along a quiet, residential stretch of Ditmars Boulevard, the Astoria bar is like the brick-and-mortar version of Tiesto walking into grandma’s: A red velvet rope guards the entrance, scantily clad friends stand outside taking a cigarette break and a live DJ blasts pop music that spills onto the sidewalk seating. At one point on a recent Friday night, an elderly man pushed his walker back and forth, staring in confusion. 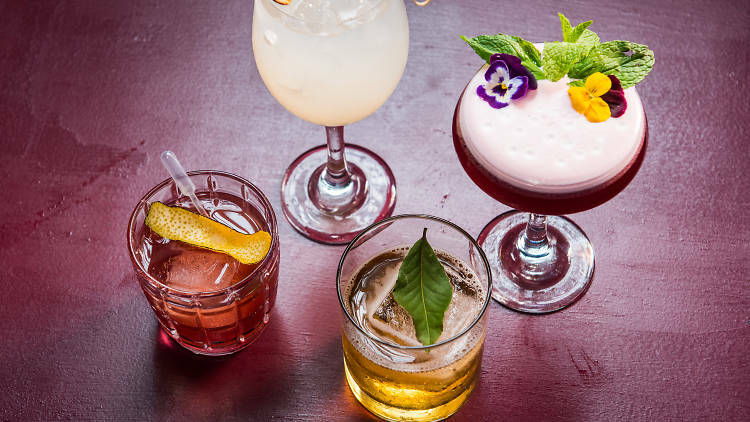 The bar serves eight drinks—four low ABV and four dry—each laced with several droplets, theatrically squeezed from a plastic pipette by the server. The Stoney Negroni, with Cocchi Americano, dry sherry and a French aperitif wine, makes for a slightly minty, less bitter negroni, while the Mellow Berry is a thick, fruity concoction served with a house-made blackberry shrub and orange bitters. If you’re staying dry, the Pear & Parsnip is “spiked” with Seedlip, a distilled non-alcoholic spirit, and mixed with a refreshing, citrusy shrub. After hitting the bar’s two-drink max, you do feel a sense of calm setting in, but not enough to wash away some very important questions: Is the CBD really kicking in? Or is it just one big placebo effect? Does all CBD taste this minty? Am I listening to the Backstreet Boys?